Music therapy is well-known in the West, but in South Asia, Music Therapy as known and practised in the Nepali-Indian cultural zone is very ancient — a part of the Ayurvedic system — and has both a philosophic-spiritual basis, that relates to the Elements, the distinct characteristics for health restoration or maintainance associated wity the bodies internal organs, and particularly the Chakras (the bodies energy centres — see illustration below). In Nepal Music Therapy is highly efficacious for a range of physical health and emotional-mental health conditions. The NIAP’s Classical Nepali Music technical advisor, Sita Maiya Rajchal is one of the countries foremost Music Therapists, gaining striking results from her work with a wide range of patients. You can read more about Sita and music therapy in the following article. 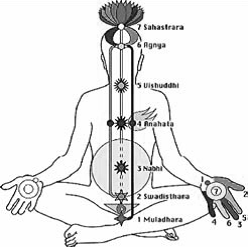 You can learn more about the scientific basis for Nepali-Indian, Ayurvedic music therapy, here. Music has many connotations but it can transcend all boundaries of communication. … But although music is mostly used as a form of entertainment, it can also be used therapeutically, as an art of healing….. read more.